THIS SHIRT HAS FRONT & BACK PRINTS. IF YOU WANT IT, GO FOR IT! IF YOU'RE NOT SURE, DON'T! LAID FLAT : 14" ARMPIT TO ARMPIT, 22" TOP OF STRAP TO HEM. Topshop Geometric Top Size 6. Thick material with a ribbed neckline. One of my favourite pieces but sadly too small for me! Really cool unique pattern. Very small amount of pilling as shown in pictures but not noticeable when worn. Condition is Used. Dispatched with Royal Mail 2nd Class. Back Length from neck to hem = 19" (49 cm). Juicy Couture Fawn T-shirt Size small label says size 1 which converts to a size 4 UK but says XS, this top says S and fits a petite 10 but would best fit an 8 16.5" armpit to armpit Length 18" from top back of neck Crop top Couture is Queen girl with glitter tiara graphic & spellout Long sleeve off the shoulder 100% Cotton Good Used condition Dispatched with Royal Mail 2nd Class. There may be a little bobbling or a few loose threads, but if there are any other larger problems, I will be very happy to help solve the issue MISTAKES DO HAPPEN. Armpit to Armpit - 13.5" (overall chest size 27"). ASOS design. Petite black t-shirt with elasticated hem with lace detail around the neck. Topshop Size 8 Blue Ribbed Crop Top Used Good Condition. 1st Class Postage. Condition is Used. Dispatched with Royal Mail 1st Class. H & M ladies cropped top size 16 colour black & white,zipped up the back.Has Only Been worn once perfect condition. 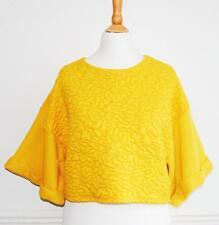 Asos Petite Yellow Jersey Lettuce Hem Long Sleeve Crop Top Size 10. Condition is Used. Dispatched with Royal Mail 1st Class. NEW LOOK SIZE UK 6. BLACK LOOP NECK TOP. Monki black halter tie neck backless crop top. Size XXS // 155cm // UK 4. Second-Hand Clothing. We take the size straight from the Manufactures Label. Still unsure?. Add any other Item and get 50% off the lower price one! 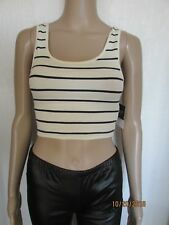 TOPSHOP PETITE SIZE 8 BLACK AND WHITE STRIPED CROPPED SPRING TOP. Condition is great Dispatched with Royal Mail 1st Class. THIS SHIRT HAS A FRONT PRINT ONLY. IF YOU WANT IT, GO FOR IT! IF YOU'RE NOT SURE, DON'T! LAID FLAT : 15" ARMPIT TO ARMPIT, 21" TOP OF STRAP TO HEM. A lovely halter neck top. The top is quite petite in size. Would fit a size 6-8. Red & white striped crop top. Worn once in perfect condition. 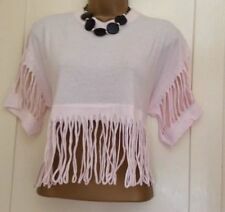 Topshop Petite Size 10 Crop Top. Condition is Used. Dispatched with Royal Mail 2nd Class. MOSS GREEN. STRETCH JERSEY COTTON. More or less cup C max D. SIZE 10-12. New Look Petite top. UK 14 EU 42. Wht. Sleeveless. Strappy. Lace style trim.